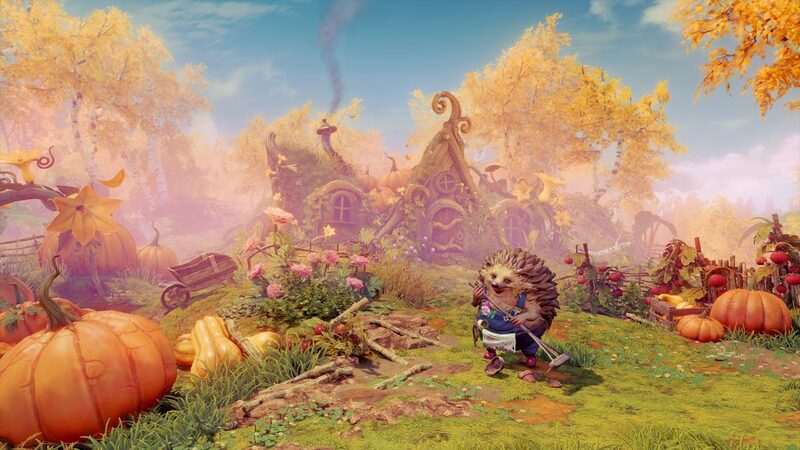 It’s felt like an age since we last visited the fantastical world of Trine. The first game was released back in 2009, followed by Trine 2 in 2011, and then Trine 3: The Artifacts of Power in 2015. Now, four years later, Frozenbyte is once again opening the pages of its fairytale book so that Zoya the thief, Amadeus the wizard, and Pontius the knight can reunite for Trine 4: The Nightmare Prince. 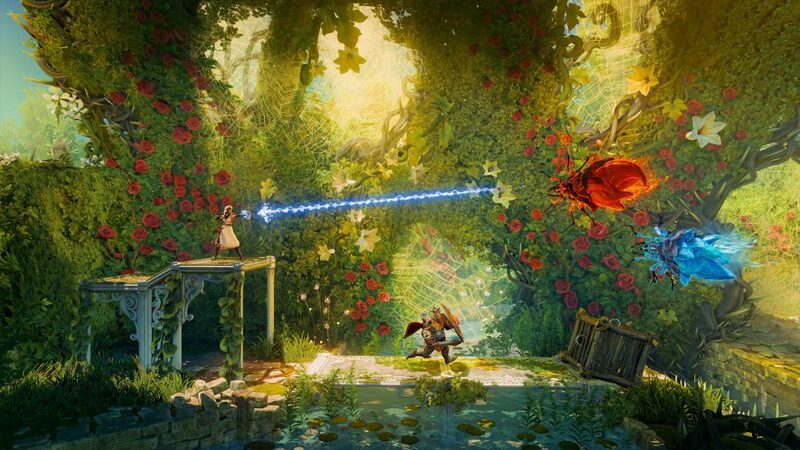 Trine is known for its whimsical world, fantastical story, and most importantly, its delicate co-op puzzles. Being able to switch between Zoya’s bow, Amamdeus’ magical powers, and Pontius’s sword and shield gives you a wealth of combinations to try out when overcoming each conundrum – whether that’s feeding a gigantic frog, stopping the flow of lava, or finding a workaround for a broken elevator. At this point in the series, fans should know the various techniques for beating a puzzle – Frozenbyte even has names for them. I’m shown one puzzle that can be easily bested using the ‘elevator’ technique. This is achieved by using Zoya to connect two objects using her grappling hook, with one end of the rope tied to a platform, and the other to a cube conjured by Amadeus. Using the cube as a counterweight, you place the characters on the platform and let the cube drop, causing them to be lifted into the air – a makeshift elevator that gets you to otherwise unreachable parts of the level. 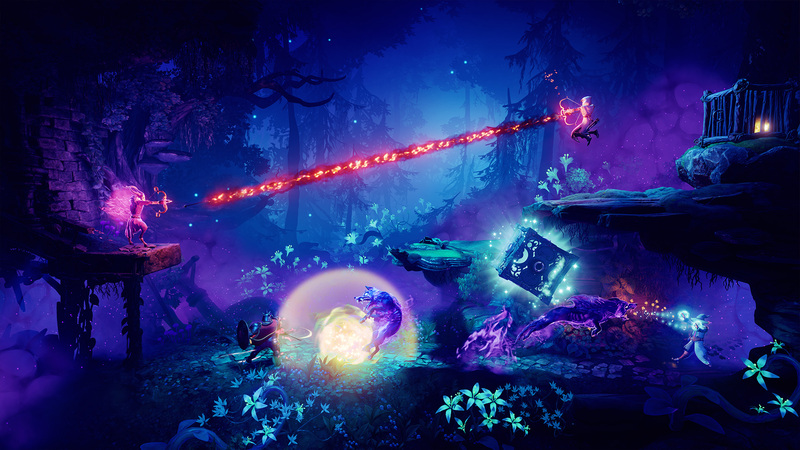 Frozenbyte previously tried to change the Trine formula up by boldly moving away from the side-scrolling format with Trine 3. 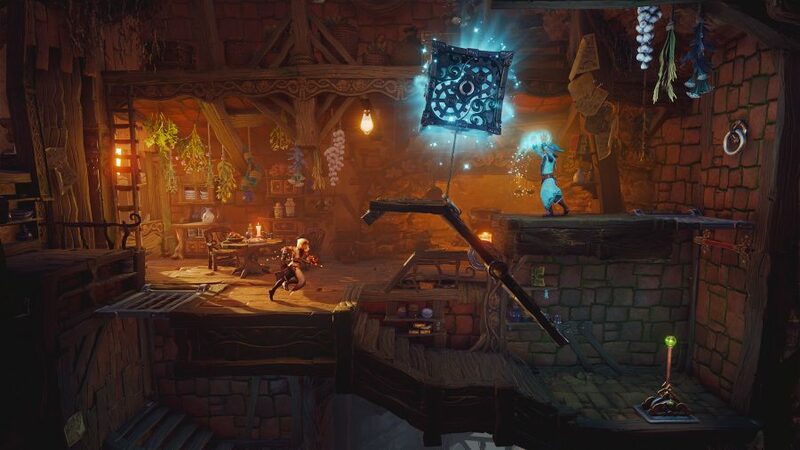 It wasn’t received so well by fans, so in the wake of that, the studio has decided to retrace its steps for Trine 4. “We’ve returned to our roots in terms of design,” Tuovinen explains. “We looked at all three games and decided to take the 2.5D style of Trine 1 and Trine 2 and work it into the puzzle design.” Those who miss the left-to-right puzzle platforming shenanigans of the first two games can leap for joy, then. Nightmares and dreams are at the heart of this Trine installment, then, which is why all the enemies you meet are ghostly spectres. To be specific, they’re the fears of the game’s cute woodland characters made manifest. On their adventure, the heroic trio meet a friendly badger whose house has been invaded by these nightmares. On further inspection it seems as though their woodland friend has a problem with his prickly neighbours, as the nightmares are conjured as vicious looking hedgehogs, complete with razor sharp teeth. We’ve seen Zoya, Amadeus, and Pontius battle giant octopuses, evil shamans, and monstrous dragons, but in Trine 4 we’ll be able to see what they’re really scared of – exploring the darkness inside their psyches. Until that is revealed there are, of course, plenty of puzzles to keep you busy. Trine has always found that sweet spot between mildly frustrating and completely obvious puzzle design. Battling with the finicky physics of the series, and trying out the unique abilities of each hero to see if that solves the issue, has become a staple of the series. 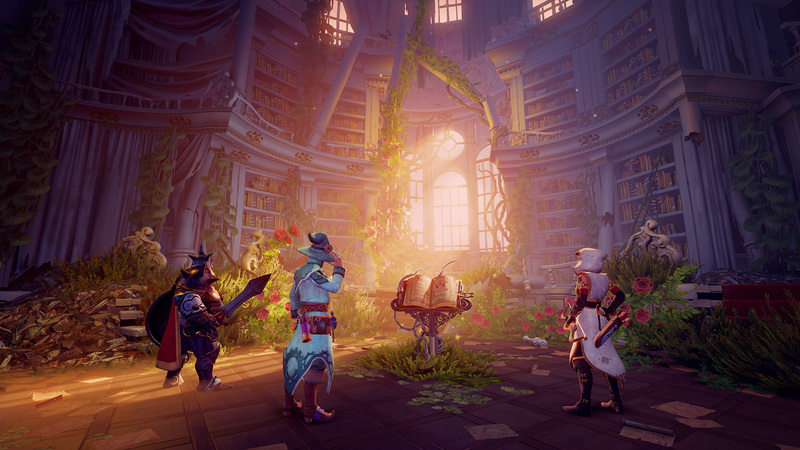 What’s always helped in those moments when you’re stuck is the fact that Trine’s world is staggeringly beautiful – you can’t stay mad for long. 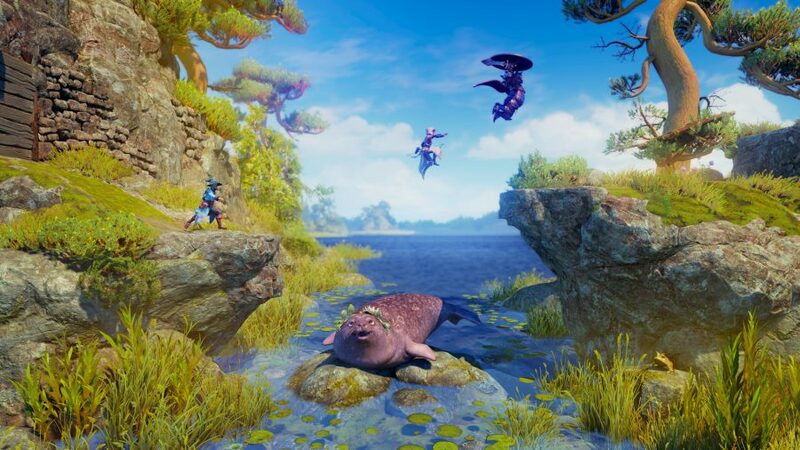 And Trine 4 looks as colourful and magical as ever, if not more so. Puzzles are designed within a single screen, meaning that backgrounds are framed in a way that maximises the aesthetics. Every puzzle has a scene behind it like a cosy badger’s home filled with bits and bobs, a gloomy cavern with neon mushrooms, or a landscape soaked in orange from a sunset. Each section looks like it’s a detailed illustration straight out of a children’s story book. And every stage has a glow about it that fans will know well, as if everything has just appeared with a puff of magic, twinkling in pleasant hues. 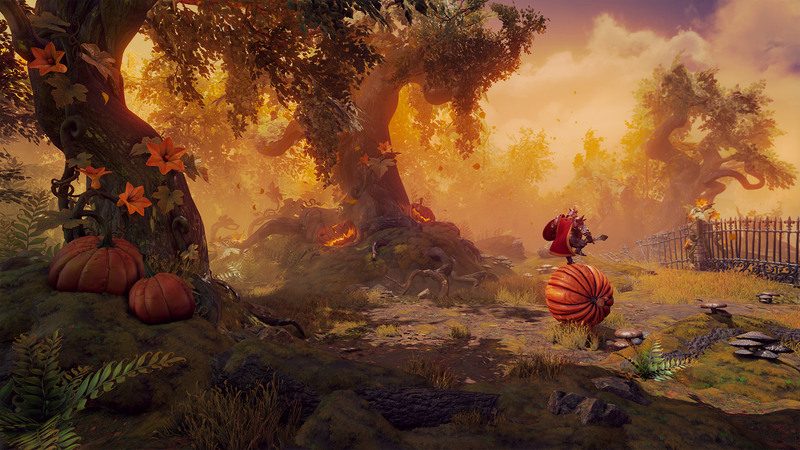 The Trine series is at its best when capturing a sense of magic. It’s there when a huge creature of fantasy emerges in sparkling form to take up half the screen. And it’s there when you suddenly discover a smart solution to a puzzle that’s had you and a partner stuck for a whole ten minutes. 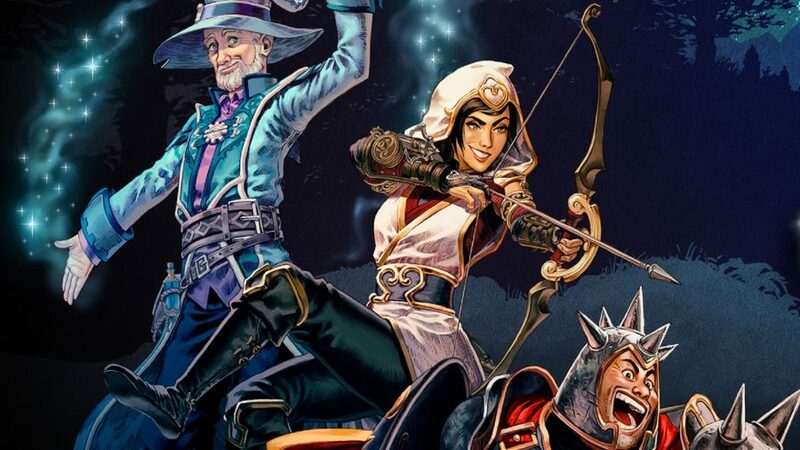 What I’ve played of Trine 4 so far has me confident that it’ll continue that legacy.